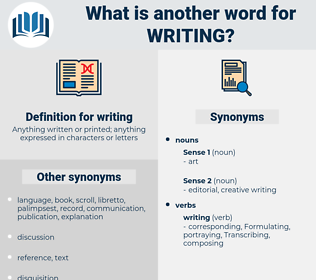 What is another word for writing? regards, applications, logs, requests, demands, reaches, Ladies, claims. representations, authors, contributions, inputs, documents, notes, FORMATS, skills, components, stands, Phases. footnotes, sections, pleading, inscription, spelling, printing. 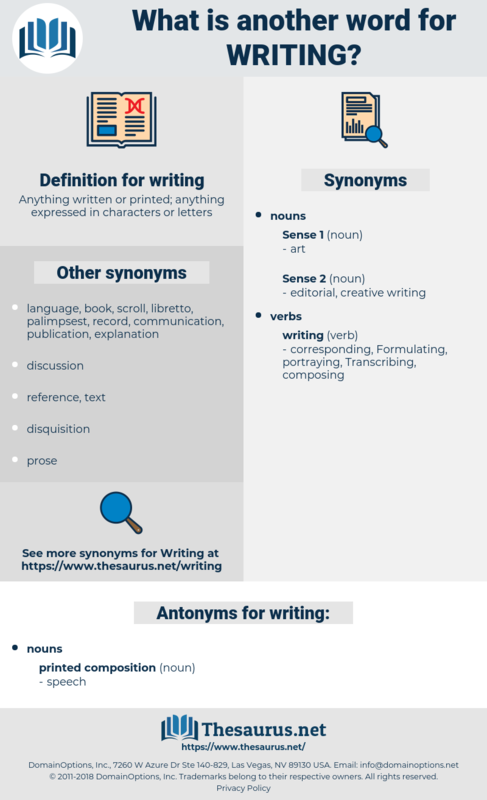 Incorporating, insert, liberating, composing, Elaborating, Originating, Indicating, complete, available, representing, Noting, determining, detailing, Addressing, Submitting, Liberalizing, Prescribing, devising, supporting, Presenting, Dispatching, Re-entering, Enshrining, defining, develop, developing, sending, Restoring, speaking, connecting, issuing, exhibits, sets, inputting, emailing, toppling, forging, suffering, spending, Fulfilling, parts, ceiling, sponsoring, Employing, testing, concealing, talking, working, Requesting, designing, add, Adding, being, Achieving, contacting, reaching, releasing, items, Providing, saying, honouring, documents, coping, taking, becoming, Codifying, freeing, shaping, Forming, keeping, leading, signing, framing, dropping, table, according, sections, day, dealing, -, putting, past, shipping, going, Doing, downing, good, drafting, typing, pleading, spelling, printing. authored, co-authored, documented, Worded, labeled, pamphlet, spelled, Scored, penned, sealed, decreed, Meant. drafting, documentary, paper, redaction, written, essay, language. You know I never can speak of what I am writing." Ah - what am I writing? hieroglyphic, Patristics, printing process, hand, notation, orthography, typing, coding system, writing system, script, skywriting, handwriting, capitalisation, printing, hieroglyph, typewriting, notational system, patrology, capitalization. work, oeuvre, written communication, black and white, body of work, written language.